The majority of the database load usually is involved with reading. Because of this, you can improve the performance of the system as a whole by improving the performance of reading from the databases. You can use this pattern to improve the performance of reading from databases by caching in memory data that is read frequently. This is a technique where data that has been used is placed in a cache, so that it can be read in from memory (rather than from the disk) the next time it is used. Typical examples of data that are cached are results of time-consuming queries, results of complex calculations, and so forth, in database operations. 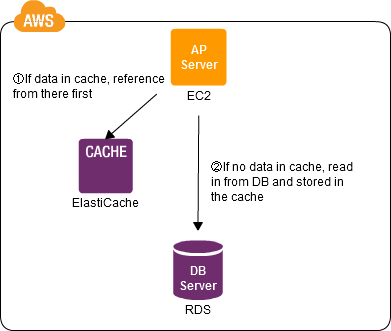 "ElastiCache" in AWS is a memory cache service. This service is provided with an automatic recovery function for the case of a failure. Prepare the memory cache. You may use ElastiCache, or you may use the open source memcached in an EC2 instance. When data is read in, data in the memory cache is referenced first. If the data is not there, it is read in from the database and stored in the cache. You can use high-speed memory for the cache to reduce the load of reading from the database, improving overall system performance. You can use ElastiCache to streamline the operation, and ElastiCache is robust to failures. Using the cache may require you to modify the program that accesses the database.